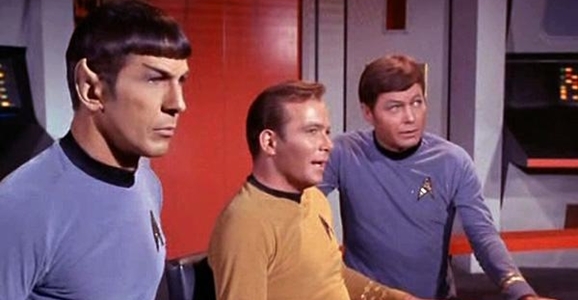 Nearly 50 years after the show premiered, the original Star Trek is one of the most beloved and iconic TV series of all time. All the spinoffs and tie-ins that have come in the decades since wouldn’t have happened if Gene Roddenberry hadn’t created something special back in 1966. In spite of a great cast and plenty of behind-the-scenes talent, Star Trek’s original three-season run wasn’t without its problems. In fact, a 1968 memo from Gene Roddenberry shows the series’ creator addressing character development issues with Kirk, Spock, McCoy, and others. 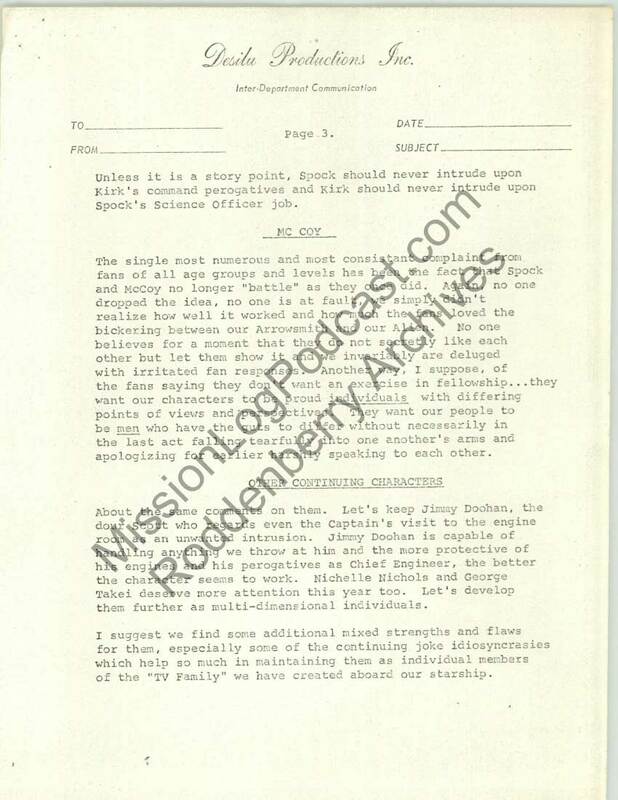 One of the most often heard complaints re: Kirk from fans is that he is too “jolly,” and that he seems to be actively seeking friendship and approval from his subordinates. Our audience likes Kirk best of all when he is at his toughest and then they like contrasting cabin scenes where we learn in privacy that he is not as tough as he pretends. In our best scripts he has volunteered information, had opinions, pressured the Captain, argued with him…and there is certainly no rule on STAR TREK that Spock cannot occasionally be proved right and Kirk wrong. There is no basic reason why giving scenes to Spock need necessarily reduce the number of Kirk scenes. Indeed, the more multi-dimensional the one, the more exciting the other. Unless it is a story point, Spock should never intrude upon Kirk’s command [prerogatives] and Kirk should never intrude upon Spock’s Science Officer job. So what about the third leg of that core Trek tripod, Dr. McCoy? One of the things you think of most when it comes to McCoy is his verbal sparring with Spock. Heart against mind is bound to generate sparks, after all. In the memo, Roddenberry expresses his concerns that the show has lost or diminished this aspect of Spock and McCoy’s relationship. 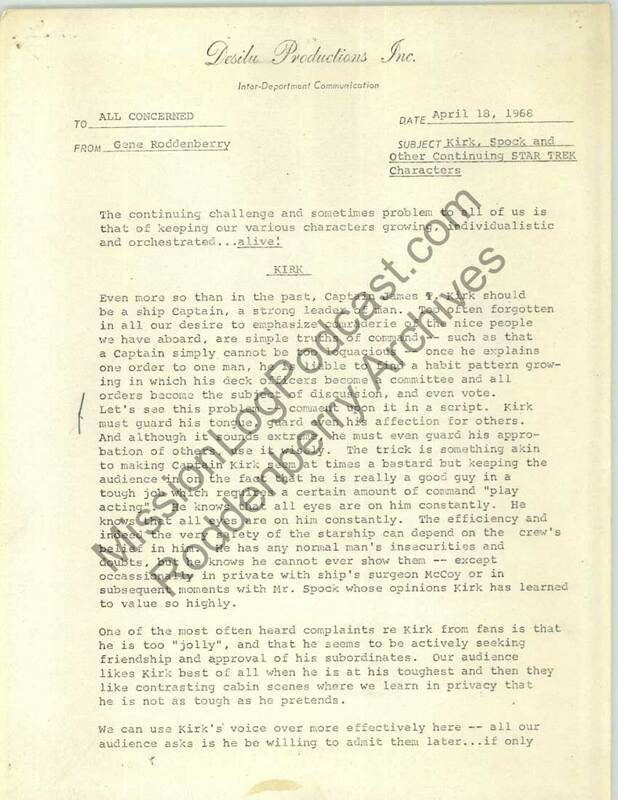 The single most numerous and most consistent complaint from fans of all ages groups and levels has been the fact that Spock and McCoy no longer “battle” as they once did. Again, no one dropped the idea, no one is at fault, we simply didn’t realize how well it worked and how much the fans loved the bickering between our Arrowsmith and our Alien. No one believes for a moment that they do not secretly like each other but let them show it and we invariably are deluged with irritated fan responses. 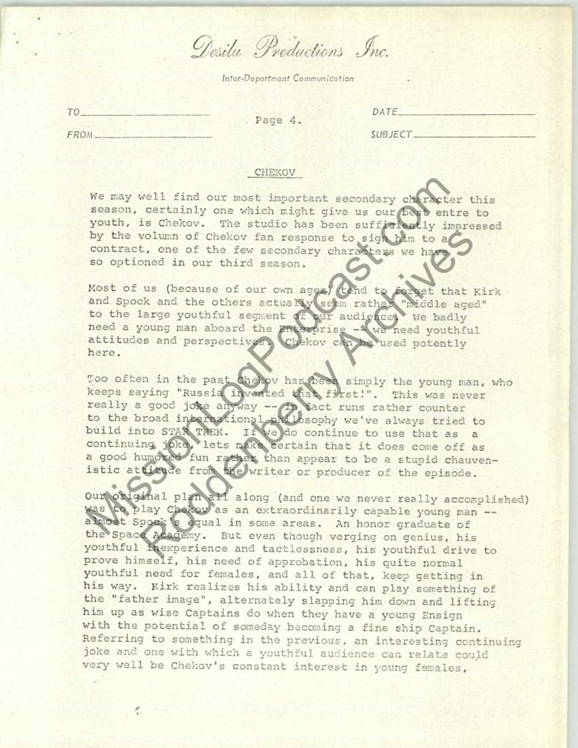 Another way, I suppose, of the fans saying they don’t want an exercise in fellowship…they want our characters to be proud individuals with differing points of [view] and perspectives. They want our people to be men who have the guts to differ without necessarily in the last act falling tearfully into one another’s arms and apologizing for earlier harshly speaking to each other. 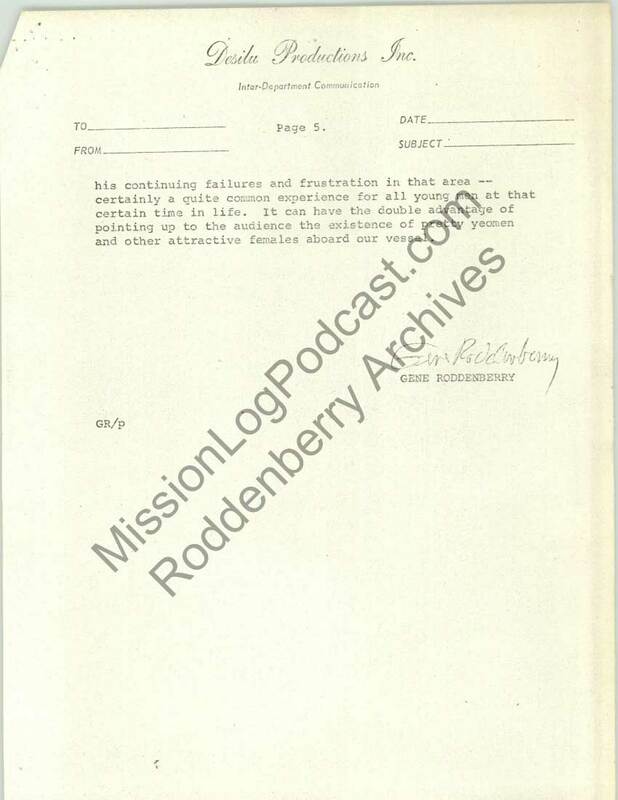 When Roddenberry wrote this memo, on April 18, 1968, Star Trek’s second season had finished airing only a few weeks earlier, and the notoriously troubled third season was set to premiere the following September. Although a letter-writing campaign from fans had helped earn the show a third season, all was not well. The show’s ratings had dropped during season two, and NBC was shifting the show to a less-than-desirable time slot. 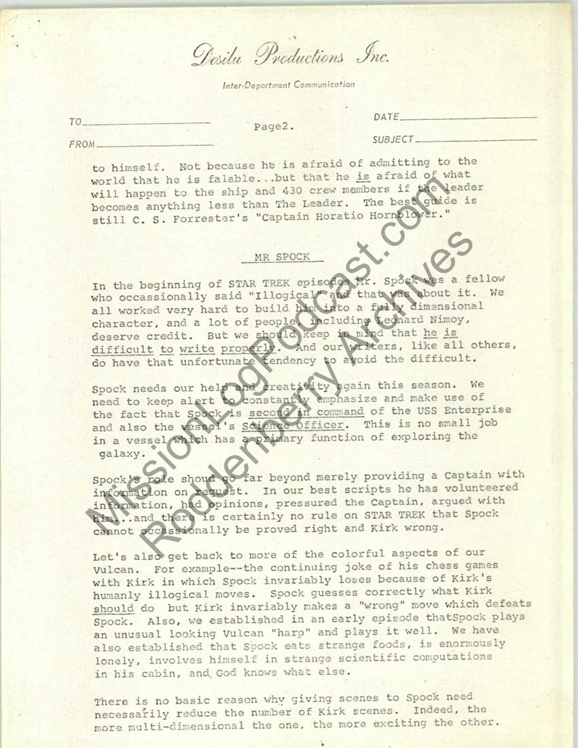 On top of that, they also slashed the show’s budget significantly, resulting in episodes like “Spectre of the Gun,” which had the Enterprise crew forced to reenact the shootout at the O.K. Corral…in front of minimalistic Western set pieces that could have come from a high school theatrical production. You can read the rest of Roddenberry’s memo below, courtesy of the Mission Log Podcast. You can also click each of the images for a larger, easier-to-read version.